Did you know it only takes 7 seconds to make a first impression? And that you can accurately judge someone’s personality from a 3-minute conversation? At least those are the facts according to a new infographic from online video resume and interviewing platform SparkHire. 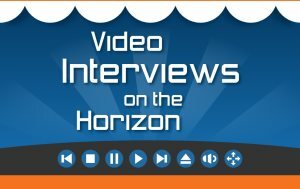 The infographic, “Video Interviews on the Horizon,” shows how staffing companies are getting “futuristic” to nab the top talent by conducting video interviews. 1. You can conduct 10 one-way video interviews in the time it takes for one phone screen. If it only takes a short amount of time to make an impression, who wants to waste hours during the recruitment process? The infographic explains how a typical phone interview can take up to 30 minutes. Swapping the phone for a webcam can decrease your time-to-hire as research shows the average time to complete a hiring process is 45 days. This will help you screen and hire more candidates in a less amount of time. 2. Most staffing pros know within 90 seconds if someone is right for the job, yet the typical in-person interview takes about 40 minutes. Many employers are hesitant to switch over to video because they feel like they’ll miss out on the “real” candidate. Yet, the infographic says that 55 percent of nonverbal cues affecting first impressions are eye contact, dress and behavior—all things easily documented by video. Even better, if the video interview is recorded, you can always go back and watch the interview to review and analyze the candidate’s nonverbal cues. 3. Video interviews save approximately 67 percent of the travel costs associated with hiring. This is huge, because the infographic explains how the average roundtrip airfare for 2012 was $378 and the average hotel stay cost $173/night. Shifting to video helps save employers and potential employees time and money.